The state of Vermont reports that there are no mountain lions– what Vermonters often call catamounts– in our woods, but the number of sightings claimed by Vermonters suggests that at least a few of the big cats have passed through the state in recent years. We found two such stories without looking too far. Our first story was shared by Brad Washburn, of Marshfield, and the second is from U-32’s Robert Browning. Recently, a talk hosted at Goddard College in the haybarn theater, suggested that people may well have been right about what they saw: catamounts have been visiting Vermont and are making a comeback, moving east across the United States from their healthy populations in the West. Sue Morse, the woman who gave the talk and runs the Vermont-based organization Keeping Track, goes all over the United States studying large carnivores. 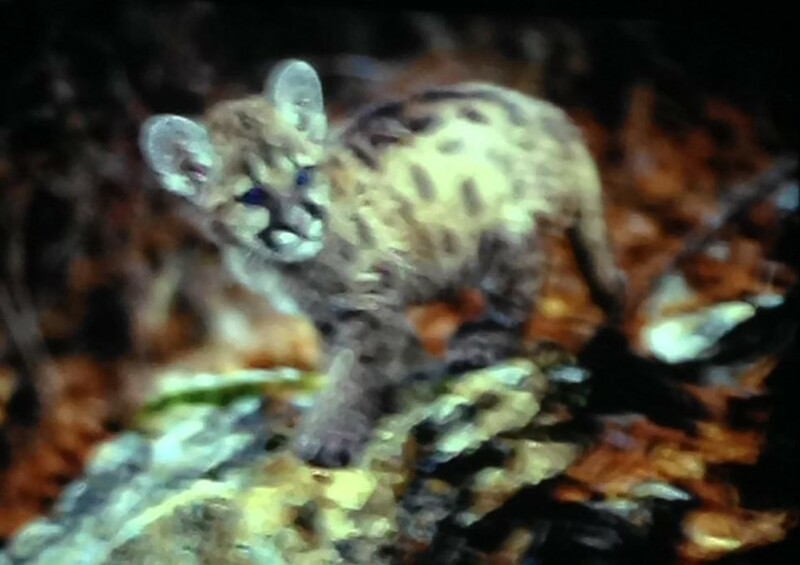 She has observed and studied mountain lions in Florida and Utah, among other places. Sue shared that, even with the recent sightings within the past ten years, there have been few confirmations in Vermont. Confirmed sightings include tracks found in the same area that the catamount was seen, or evidence of a mountain lion kill. Mountain lions, known in Vermont as catamounts, are described as a large cat, about waist height, with a long tail. Their cousin, the bobcat, is smaller with a short tail and long eye lash spurs above both eyes. They also have lighter fur. The track of a mountain lion leaves no claw marks, but the toes are more spread out than a bobcat and center farther right. 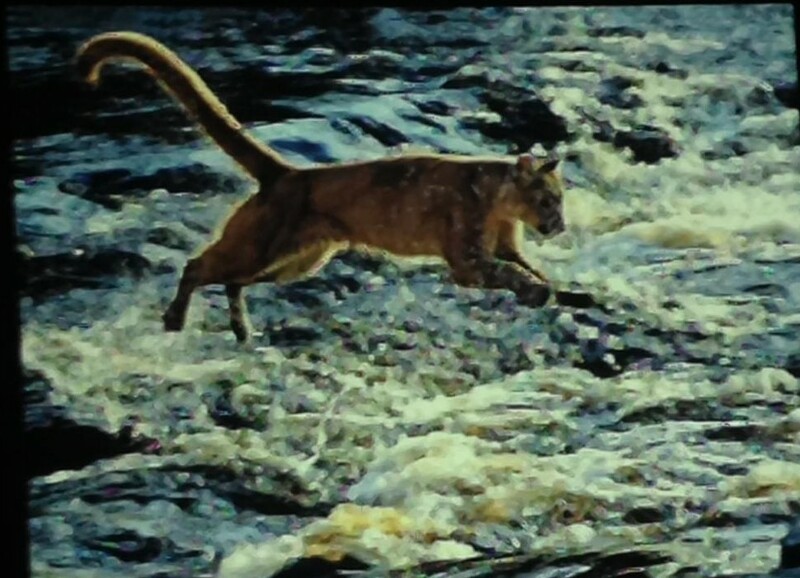 Pictured on the right is a mountain lion demonstrating its tremendous strength and agility, crossing a river somewhere out west. It turns out that the Northeast (Vermont , together with New York, New Hampshire, Massachusetts and Maine), has more forest cover and green wilderness than any other area in the continental U.S. In the west there are much larger pieces of wilderness but not as much forest cover. Catamounts need places in the woods with heavy cover and remote places to make their dens. These areas should be preserved and left alone, so this species can make its way back into the state. One thing that we should do is make it illegal to hunt catamounts, nationwide. Hunters in South Dakota seem to feel the need to harvest catamounts for their fur. The big cats are tracked with dogs and shot out of trees. Ms. Morse explained that the catamount, acting as an “apex predator”, is actually good news for our hunters because they keep our deer populations healthy, which is good for the whole ecosystem. In other parts of New England, where deer are overpopulated, catamounts could make a major impact in restoring forests that have been hit hard by dense herds of deer.